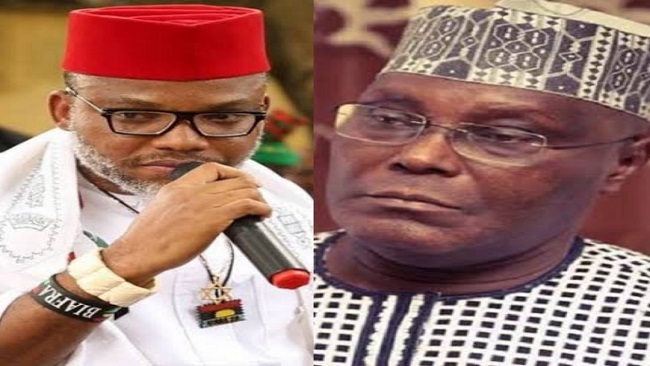 The leader of the outlawed Indigenous People of Biafra (IPOB), Nnamdi Kanu, says the presidential candidate of the Peoples Democratic Party (PDP), Nigeria’s main opposition party, Atiku Abubakar is from Cameroon. Kanu made this allegation during a live broadcast via Radio Biafra in London, United Kingdom on Saturday, February 2. The secessionist leader also blamed the PDP Presidential candidate for the failure of Alex Ekwueme during PDP convention in 1999. His words: “Some of you do not understand that the person behind the failure of Ekwueme in 1999 during PDP convention was Atiku “Do you know that Atiku Abubakar is from Cameroon? His area of Adamawa was in Cameroon,” the IPOB leader said. The IPOB leader also urged “Biafrans” not to participate in the forthcoming election in Nigeria, noting that by voting “Biafrans” will be “perpetuating the misery of our people”. His words: “By voting, all you are doing is perpetuating the misery of our people. “To vote in the zoo means to endorse 1999 fraudulent constitution. By voting, all you are doing is perpetuating the misery of our people”. On calling off the referendum given to IPOB members and “Biafrans” to boycott the 2019 election, Kanu called on the Nigerian government to sign the document given to the government. According to the IPOB leader, that is the only way the 2019 election would not be boycotted by IPOB members and “Biafrans”. “Those pressuring me to call off the election boycott know what to do, sign that document I gave to you and I will call off the election boycott, you know what the document contains,” he said. Kanu’s statement is coming after the leadership of the IPOB had in January, declared February 16, 2019 date for a referendum to ascertain the number of Nigerians who want a separate Biafra republic through a peaceful and democratic process. Kanu is leading a group seeking secession from Nigeria. The group has since been proscribed by the Nigerian government.